As a performance and wellness consultants, we often get questions about whether milk is good for us or not so when I was asked to write an article on milk I gladly accepted thinking it would be an easy ten-minute story. Tell them how bad milk is and I’m done. Well, here I am after hours of research struggling to put it all into a short article. Most of us, at some point in our lives, have been told “drink milk its good for you”, based on the claims that it is good for healthy bones and is a healthy protein for building muscle. There are studies on websites that show us how good it is for our teeth and that it can even cure PMS, these are some pretty bold statements that are based on questionable research. I know this article will meet with loads of opposition and so I want to preface it by saying I’m not suggesting, (o.k., maybe I am) that you stop drinking milk, all I’m saying is don’t drink it because you think it has health benefits. The main reason people drink milk is their belief that it is a good source and calcium and will help them build strong bones. While calcium is used to develop bones when we are young, its role in bone health in adults is to help prevent bone loss, not to build bone. Mega doses of calcium don’t reverse osteoporosis. In fact, a research paper done by Thijis R Klompmakers compiled numerous studies to show that excess calcium can actually cause bone loss, more on this later. Isn’t it interesting that the countries that drink the most milk also have the highest rates of osteoporosis? It’s also interesting to see that as milk consumption increases in cultures that traditionally did not drink milk, the rate of osteoporosis rises at the same level. In the United States, which is the largest consumer of milk as well as the country with the highest rate of osteoporosis, the RDI for calcium has again, recently been raised and is now 1500 mg. Most other countries have a recommended dosage of calcium under 700mg. So as you can see the calcium in milk is not helping reverse or even stop osteoporosis. As far as calcium goes, milk’s source is not as absorbable as calcium from plants, which deliver minerals in the amino acid chelated state. Minerals can only be absorbed when they are attached or chelated, to an amino acid, which is the way that nature packages them for us when we eat vegetables. If you are worried that you are not getting enough calcium, which is a valid concern, then supplement with amino acid chelated minerals. Earlier, I mentioned that research has shown that too much calcium can actually be a cause of bone loss. When we overload our bodies with poor nutrients, such as a poor calcium source, our bodies work harder and wear out faster. If we get too much poor quality calcium the cells that are responsible for bone formation work too hard and wear out. Once these cells die off our body can no longer create new bone and the result is osteoporosis. There are numerous research studies that show that increasing calcium consumption does not reverse osteoporosis and may increase the rate of bone loss and one of the reasons is the quality of the calcium that is typically consumed. Milk is also very mucus forming, which causes a reduction in the uptake of all nutrients including minerals. This mucus formation is linked with high acid levels in the body. Our blood must maintain a slightly alkaline level or we will die quickly. In her book “Bone Health Revolution”, Vivian Goldschmidt shows that when we overload our bodies with acid forming foods, like milk, our blood is pushed toward the acid side, so to maintain health our body will move calcium, which is alkaline, from the bones to neutralize the acid in our blood. So much for the statement “drink milk for strong bones”. On the other hand vegetables are typically very alkaline and help us keep our blood pH where it should be which means veggies not only supply the right calcium but can help us keep our calcium in the bones. Want some proof? A Harvard study on the benefits of milk was carried out on 78,000 nurses. The results were not what the researchers were expecting. The risk of hip fracture of those drinking more than one glass of milk per day was 45% higher than those who took in the same amount of calcium from non-dairy source. Want MORE proof? A 2001 study by Sellmeyer DE, et al, published in American Journal of Clinical Nutrition, found that “elderly women with a high dietary ratio of animal to vegetable protein intake have more rapid neck bone loss and a greater risk of hip fracture than do those with a low ratio. For one more nail in Milk’s coffin have a look at what John McDougall, MD, founder of the McDougall program, has to say. Is milk contributing to the epidemic of childhood obesity and diabetes? Experts say yes! In addition to the mineral issues we have a caloric issue. Milk and its derivatives make up one third of the adult diet, leaving less room for us to get proper nutrients. 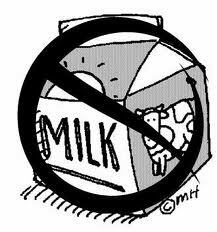 In the U.S. up to one half of the caloric intake of school age children comes from milk-based products. Is there any wonder why we have an obesity epidemic in most of the world today? High-fat dairy products such as cheese, butter and cream contain saturated fat. Saturated fat in its cooked form is directly related to elevated blood cholesterol levels. The consumption of high-fat, cooked dairy products has also been linked to atherosclerosis, heart disease and stroke. Finland, which has one of the highest death rates from heart disease in the world, also has one of the highest rates of dairy product consumption. Now before you think just switching to low-fat dairy products is the answer you should know that low-fat milk and cheese products are still significantly high in total fat, saturated fat and cholesterol. For example, 2% milk still derives one third of its total calories from fat. Skim milk mozzarella with approximately 15% milk-fat is considered a low- fat cheese, yet a 1-ounce slice contains 5 grams of fat, totaling 56% calories from fat! Just the fact that there is a wide range of “reduced fat” dairy products available is proof that there are serious health concerns over high-fat dairy products. At Windhawk, we find that dairy products are one of, if not the leading cause of food allergies and food sensitivities resulting in an inflammatory response. These allergies are linked to the high protein content of dairy and according to a 1980 “Allergies to milk” study by Bahna, S., allergies are worse in those that consume “low-fat” dairy products. In the book, ‘Dietitians Guide to Vegetarian Diets’, the author suggests that infants who react to milk also have a greater likelihood of developing allergies to other foods. Not enough proof yet? Then how about milk’s link to diabetes? 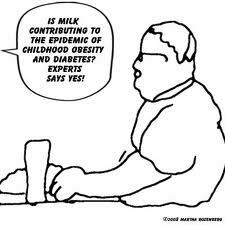 Several studies have linked cow’s milk to diabetes in children. An immune reaction, triggered by dairy consumption in diabetic children may lead to the destruction of the body’s insulin-producing cells. Breast-fed infants who are not fed cow’s milk seem to have a measure of protection against diabetes. Avoiding cow’s milk may delay or prevent diabetes in susceptible individuals. A 2003 study, published in the Annals of Nutrition and Metabolism by Thorsdottir I, Ramel A., of 4,701 ten to sixteen year-old adolescents from 11 European countries found that cow’s milk and animal product consumption were associated with higher rates of type 1 diabetes when Icelandic data was excluded. The bottom line is this, milk has far more negative qualities than positive ones and if you are drinking it thinking that you are getting health benefits such as calcium, might I suggest that you go for a source that has less possible side effects. Organic dark green leafy vegetables are a great source of calcium and also a source of quality amino acids, which are the building blocks of protein. These dark greens are also very alkaline which helps keep the calcium in your bones. If you want a calcium supplement then make sure it’s in the chelated form. For more information about proper supplementation and true chelates, do your body good and read about Windhawk’s Vitamin Mineral Formula.